Once again, I followed Elizabeth to one of her cooking classes. This time at the Cypress Community Center. A very nice facility with the industrial kitchen which fit 12 people a wee bit too snugly but we managed. On the menu were three summer desserts: Fruit Crisps, Red Velvet Cupcakes with Cream Cheese Frosting, and Dark Chocolate Mousse. I was happy with my decision to grab a small dinner before heading out the class. The torture some of the hungry students had to suffer while busying themselves with all these lovely ingredients was tremendous, apparently. Our class was split into essentially 4 groups. 2 to attack the fruit crisps and one each to the red velvet and chocolate mousse. I was there purely for the chocolate mousse. Brandon LOVES chocolate mousse, and, as I found out from Elizabeth, it's actually a non-dairy dessert. And this whole time I thought it was chocolate and cream! But I digress. I was in the group with Darlene whom I met before at the basic cooking class at PREP and another girl. Darlene was in charge of the chocolate. The other girl whipped up the yolks. And I did the egg whites and final assembly. Elizabeth would stop whatever everyone was doing so we could watch the key part about each of the recipe. 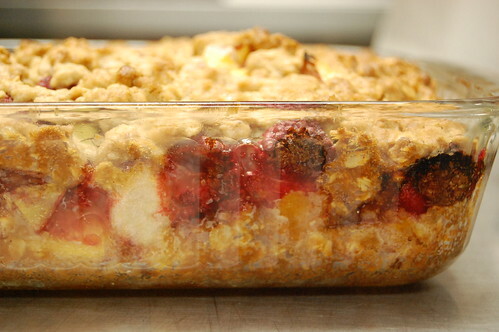 For the fruit crisp, she explained how the size of the fruit cubes is important to the texture of the cooked product. Smaller chunks of fruit = mushier fruit filling. For the red velvet cake, a recipe Elizabeth adapted from her aunt from Arkansas, we watch to see where we'd stop with the red and that the secret ingredient is buttermilk and vinegar. 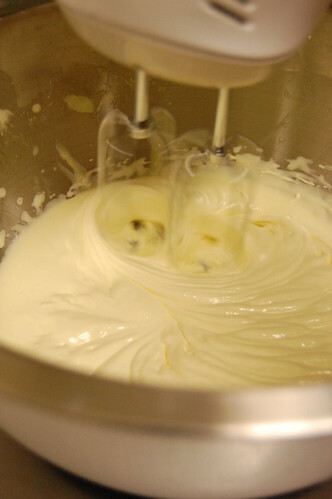 For the mousse, we watched closely for the "ribbon stage" as we whipped the heck out of egg yolks, and the soft peak for the egg whites. Elizabeth could be heard several times, "Oakley, stop banging on the bowl!". I kept forgetting that hitting the bowl would settle all the air I was trying to whip in. Whoops. And of course, the fold. 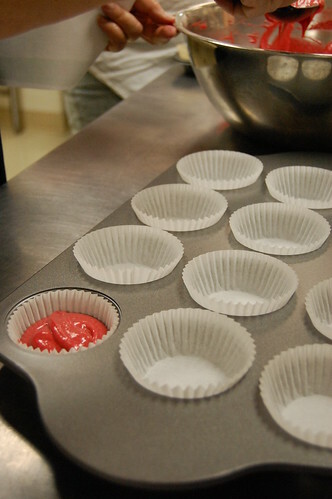 Folding the fluffy ingredients correctly will maintain the airiness. (No. Banging. On. The. Bowl!) I've folded stuff before but put on the spotlight in front of class, somehow I was like a neanderthal being handed a stick for the first time. I was quite frustrated as to why I couldn't fold properly. It wasn't until I got home did I realize that DO know how to fold. I usually hold the spatula in my LEFT hand, folding to the right. Elizabeth was showing the class with the right hand going to the right and that was how I held the spatula, and THAT was why I couldn't do it right. Ah, the joy of being ambidextrous. In the end, we all enjoyed the fruits of our labor--almost literally. The fruit crisps were yummy. 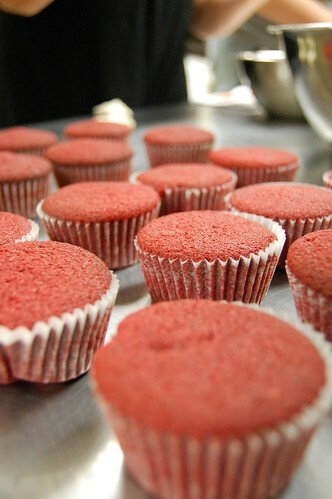 The red velvet cakes were just right...even the little baby ones! The dark chocolate mousse? It definitely rivals my all-time favorite Belgian Chocolate Mousse from Fresh & Easy. Oh god. Now I crave the rich chocolatey goodness. ARGH!